It's a strange Grey Cup Sunday evening, Wikileaks, verge of war in Korea, not so good elections in Haiti and a few by-elections that will probably go the Conservative's way. Wikileaks are everywhere on the news, more like a hole in the pipe than a leak. Aside from the obvious embarrassing moments for the people concerned it brings up how far the difference is between the powers that be and the rest of us who have to deal and live with their consequences. Ask the folks in Ireland what they did to cause the strife they'll have to put with for the next decade. 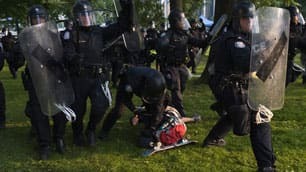 Speaking of a double standard it appears there won't be any police charged for using excessive force during the G20 cafouful. It appears one goon in a black outfit can't be told apart from another goon in black. On the other hand about 90 police officers face discipline over not wearing badges. And why did they not wear their badges? I figure they figured they were going to cause trouble and didn't want to be identified. Not really rocket science to figure out the evils of man. Looks like they will be paying the hefty penalty of loosing a days pay. A days pay to bash heads, I think in cop talk thats like a cheap night out. Of course the government has passed laws specifically outlawing the wearing of outfits that hide ones identity, whats good for the goose is defiantly not good for the gander. There are three federal byelections being held Monday, luckily for the Liberals, Mr. Ignatieff (and the rest of us) the results won't give the Conservatives a majority should they get a clean sweep. The odds of that appear unlikely with the word on the street is at best they will get two out of the three ridings. The most interesting is in the Toronto area riding of Vaughan. Historically a Liberal strong hold but the Conservatives are running star candidate, ex-police commissioner Julian Fantino. The riding in Winnipeg North is between Liberal Kevin Lamoureux and NDP candidate Judy Wasylycia-Leis. The third riding Dauphin-Swan River-Marquette has voted Conservative for more than a decade and it doesn't appear to be changing any time soon. I was watching the Grey Cup and noticed the PM wearing a green hat, looks like his team lost. Those RCMP officers looked so proud carrying the Grey Cup into the stadium. It kinda made me wonder how many people they beat up while in the custody of the nation's constabulary? Thats was a bit of a bummer vid so this should put a smile on one's face. Karl was worried about using a bad word in his post, (there are no bad words only bad intentions) so I thought of this comedic romp with lots of those 7 words your not supposed to say.